Schaumburg, IL (January 2015) – HEIDENHAIN’s top-of-the-line lathe control, the CNC PILOT 640, now offers enhanced functions and new hardware for both the machine operator and builder. 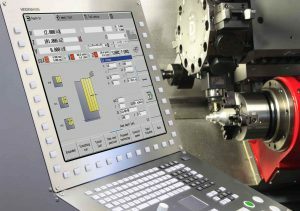 HEIDENHAIN lathe controls distinguish themselves by their convenient and simple programming, as well as their high-quality, ergonomic operating panel. With the CNC PILOT 640, operators are working with a HEIDENHAIN lathe control of the latest generation. It has been conceived for universal lathes, fully automatic turning centers, combined turning-milling machines, vertical lathes and vertical boring and turning mills up to 5-axis machining with X, Y, Z, B and C axes. For the end user, the new software offers high-resolution, finely 3-D graphic simulation. The results of turning, drilling and milling processes can be evaluated before the machining (e.g. in regard to material cuts). The Rotational View allows inspection of the part from all angles. It can be zoomed in and out on the cylindrical surface and in the tilted plane. Even the tool and the tool holder geometry can be displayed. As an option, CNC PILOT 640 now offers Load Monitoring where a multi-colored bar graph displays the load of both the spindle and the motor. Simple parameterization is available to define utilization threshold values of a reference operation. Exceeding the first threshold triggers the exchange of a replacement tool. If the second threshold is exceeded, the machine stops. In this way, tool breakage can be avoided, process reliability can be enhanced and unattended shifts can be extended. Additionally, eccentric turning and non-circular turning is now possible. This allows the machining of oval and polygonal parts, as well as cams without any additional machine elements. Further improvements include better oversight in the file manager and in the technology data display as well as the possibility to include or exclude the tool selection to generate automatic programs (TURN PLUS, automatically generates a program from created contours). New generation HEIDENHAIN touch probes are now supported with the CNC PILOT 640. For the machine builder, synchronizing functions and real-time coupling functions have been developed that allow the actual and nominal calculation of complex simultaneous movements of several axes. Up to 20 controls loops are now available, and control loop groups can be enabled. Worth mentioning is the “Copy default data” function that allows the creation of a back up file in an easy and save way. Finally, commissioning has been made easier and new ways to design OEM-specific buttons have been created. For more information, contact HEIDENHAIN PR Manager Kathleen Stoneski at (877) 565-9151 or write to us at HEIDENHAIN CORPORATION, 333 E. State Parkway, Schaumburg, IL 60173.